It was like the first day of school when Martha Stewart’s culinary director, Thomas Joseph, arrived at the 2019 Seafood Expo North America event in Boston, Massachusetts on its opening day. The seafood featured in the line has a vibrant heritage of sources ranging from Atlantic salmon farmed in the Gulf of Maine to wild sockeye salmon and pollock sourced from Alaska, and Patagonian bay scallops. The products are also accompanied by Martha Stewart signature butters and/or spice blends, with suggested recipes chosen from the 25,000 in the MarthaStewart.com archive on the underside of each package’s belly band. “The way that we develop product is we really count on our recipe database – we have 25,000 recipes, so what we love to do is take some of the most popular recipes, some of the beloved recipes that we have and that our editors love, and we like to bring them to life with products,” Joseph said. In addition to recipe compatibility, the Martha Stewart brand considers four major attributes when establishing new products, Joseph said. “Everybody wants to be able to say…’I could do that, I could really achieve that!’ It is a huge focus for us, and it’s part of the reason why we’re partnering with a lot of really fantastic vendors – to bring our recipes to life in a very convenient sort of way,” Joseph, who hosts the webcast Kitchen Conundrums with Thomas Joseph, added. Serendipity had a part to play in True North’s introduction to Martha Stewart and her brand, Joseph recalled. While on her boat in the Gulf of Maine a few years back, she stumbled across the company’s aquaculture farms near her Skylands home, and curiosity took hold. True North’s story had a strong appeal for Stewart and her team, as did the firm’s willingness to share its processes. The company’s dedication to sustainability, a core principle for Stewart and her food businesses, also proved potent, noted Joseph. For Cooke and True North, the family-focused heart of the Martha Stewart brand resonated, according to Richardson. Learning opportunities have been a perk of the partnership for the Martha Stewart team. When collaborating on the types of seafood to incorporate into the product line, True North suggested several sustainable species that could potentially pair well with a number of Martha’s Test Kitchen recipes that may have been overlooked otherwise. “There was a lot of newness coming in from this team, telling us, ‘OK, we have a lot of great access to this type of fish and it’s actually really great in this application’ – that’s another way that our partnership has been working really well and part of the reason why we love working with True North,” Joseph said. It is the hope of the Martha Stewart team that the new product line will encourage people to eat seafood, no matter their culinary skill-level or familiarity with the protein category. “We want to make sure that everybody’s comfortable cooking seafood and that if they’re a little nervous about it, there’s help and tips and tricks here, in addition to what we offer online, too, on our platform,” Joseph said. 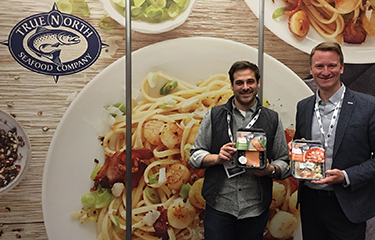 True North Seafood partnered with Sequential Brands Group, Inc., which markets a portfolio of brands including the Martha Stewart brand, to develop the new refrigerated seafood line in February. True North parent company Cooke was listed by SeafoodSource as one of the top 25 North American seafood suppliers for 2018, based on 2017 sales figures.